February 24, 2013 Today we left Kilgore Texas with sad hearts. Even though our families are used to saying long goodbyes 3 years is still a long time. Our first stop for the day was in Dallas to see Anson's brother Tim. It was really great to see his comfy little apartment and to meet his furry and hyper friend, Satchmo the cat (named after the dog in the TV show White Collar). The rest of the day was spent driving in the car. Rather boring really since it was mostly interstate driving. When it got dark we began passing large wind power fields. Quite eerie with their red blinking lights and hulking shapes. We ended the day in Colorado City at around 9 and slept at our first hotel of the trip, a Days Inn. I wasn't sure how it was going to go with the two kitties but they behaved nicely and took over and were soon purring and content on the king sized bed in our room. 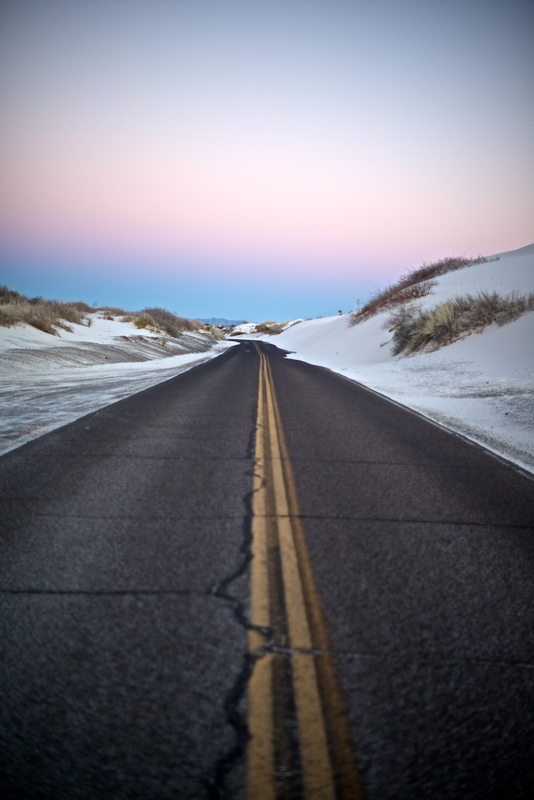 This morning we got up before sunrise, ate and left. 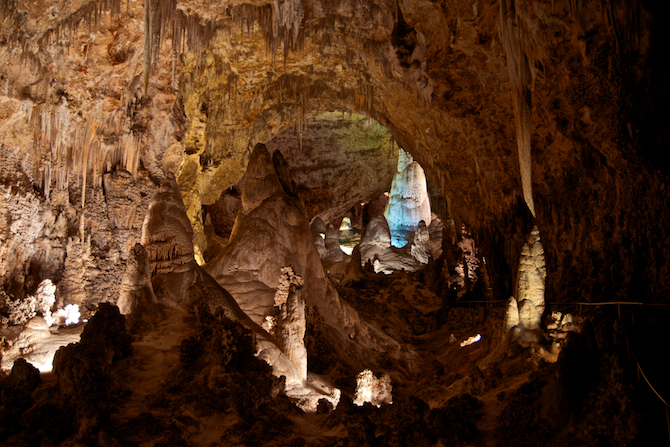 Our goal was to get to Carlsbad Caverns as soon as it opened to get as much time there as possible. We succeeded in arriving at 10:00, right when they open. Thankfully the weather has been quite cool so we were able to safely leave the kitties in the car for the time that we were exploring the caves. At the top of a hill near the park sign was some sort of ruin. We decided to take a look. It was a little strange being at such a large park site in the off season with so many parking places and open lobby spaces. Only us and a few others were there. Once we got our ticket (free now, since we have a military National Park Pass) we had one of two options: ride the elevator straight down 800 feet, or hike through the Natural Entrance which involved a mile of walking and 800 feet of descent. We opted for the adventurous route, of course, and walked in. The park ranger at the door out to the cave entrance was very enthusiastic about his job. I can't imagine repeating his lines over and over to the droves of tourists that must come in the summer months. 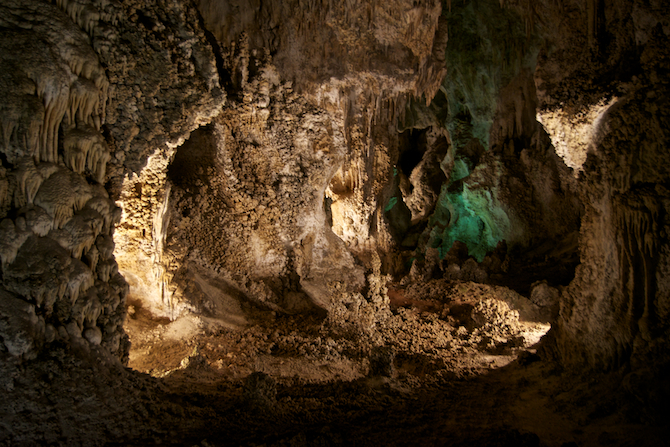 Once we left the building we walked by the amphitheater that is used for watching the bat flights during the warmer months and into the mouth of the cave. It was a really strange feeling. The entrance is huge and continues as a rather large cave almost all the way down to the large open space 800 feet down. Anson and I were so distracted by the entrance and just inside that we must have stood and photographed for several minutes every few steps. Once truly inside the cave we moved rather briskly past the more boring parts, keen on saving our time and energy for what we knew would be even more interesting features down below. Our first rock formation was a column in a pool of water. 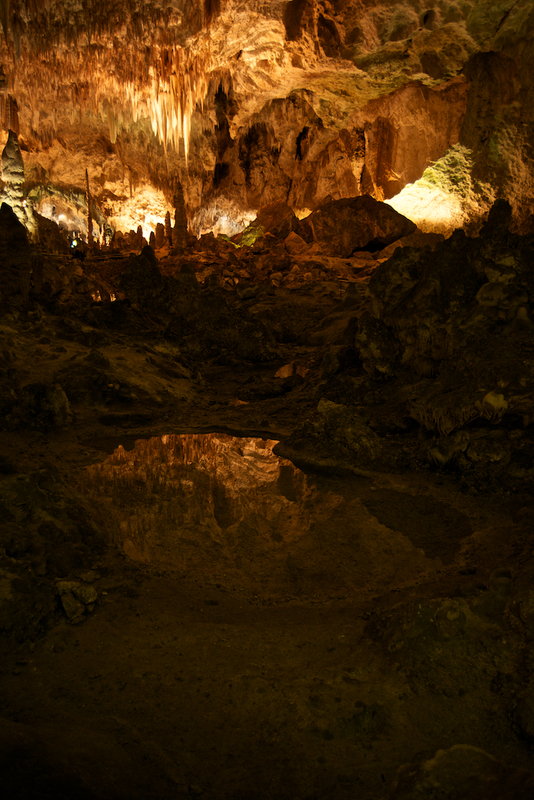 Turns out there were only a few pools of water in the whole cave. This one was near the surface and, I thought, rather beautiful. The path wound in and around fallen rocks, at one point turning so sharply it appeared to almost end in the low light. The path itself was guarded the entire length by this minimalistic shiny railing. The floor, which you couldn't see very well, was paved the entire way and mostly smooth. I was very glad I changed into my hiking boots since there was a lot of walking. The whole walking/path experience, along with the lit corners and formations, felt very modern and not at all like my childhood experiences with tourist caves... wood railings with splinters and questionable footing the whole way. Once we finally reached the bottom, where the elevators could take you, the cave opened up into a very flat room. On the maps the space is laid out in the rough shape of a cross. 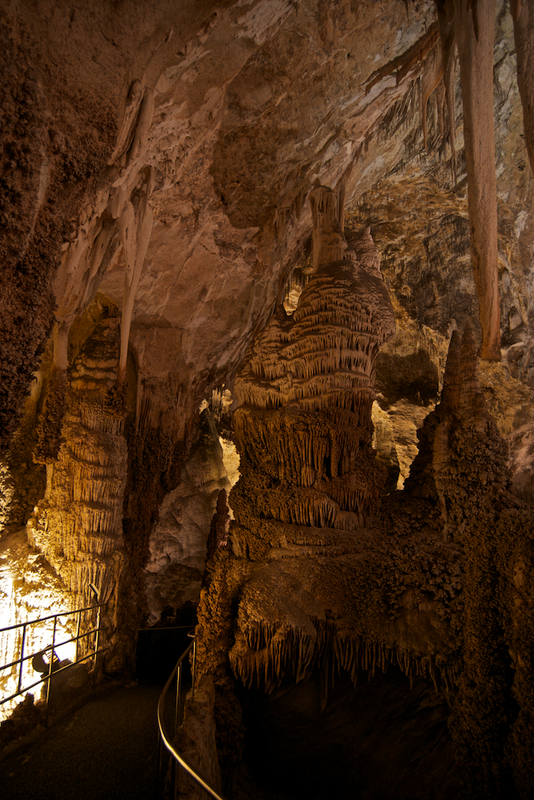 Down here there were many more stalactites and stalagmites as well as columns, draperies, popcorn and soda straw formations hanging or growing out of everything. 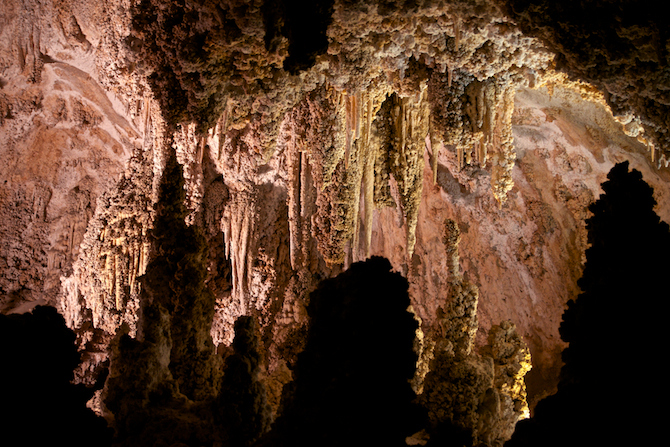 At one point there was an area called Fairyland with hundreds of little stalagmites covering the floor little a miniature fairy forest. We walked the cave floor for quite a while. 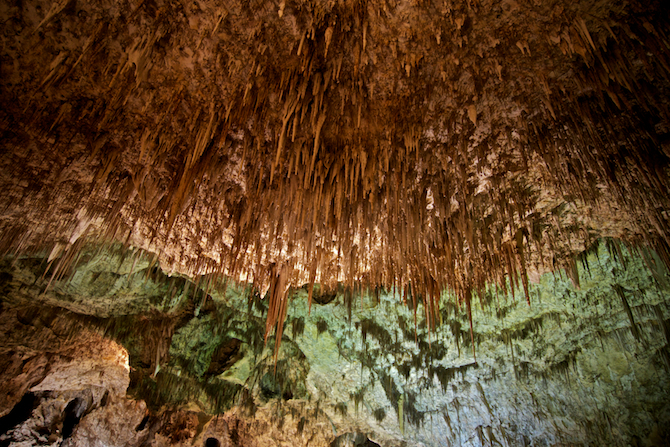 The largest area of the cave had a 250ft ceiling from which a rope hung. We were curious and asked a park ranger what it was there for. Apparently at one point they wanted to know where the cave openings above led to. 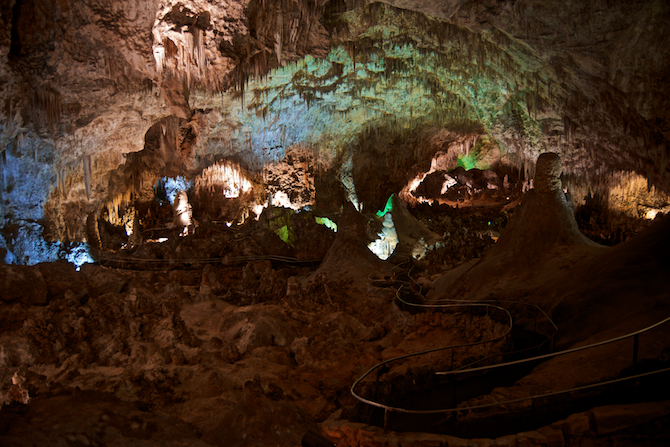 It took two days to get a rope up with balloons and tied to a stalagmite. A brave guy climbed up and further secured the rope for others to follow; they found another mile of cave connected to it. Since it took so much effort to get the rope up they left it there. A light hole, drilled into the limestone. Once we had seen all there was to see we hurried out to the kitties. We left the area at 1:30 and drove to Almagordo. On the way we came across this fantastic old rail bridge. 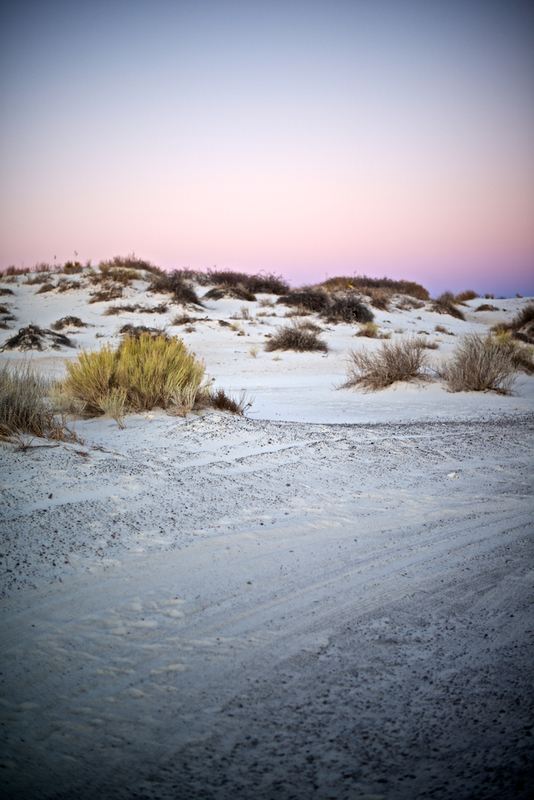 Next Anson surprised me with a stop at White Sands National Monument. To get to the park we had to drive through a missile testing range. The signs on the side of the road warned of possible delays of up to an hour. I can't imagine getting stuck there. We didn't thankfully. 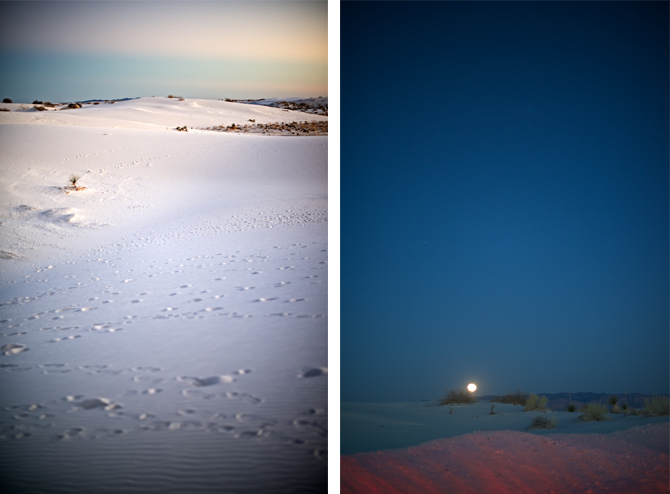 We stayed at the sands until after the sunset and the moon rose at 7. It was magnificent. That night we ended up in Las Cruces at a very comfy Drury Inn & Suites. And so ended our day.